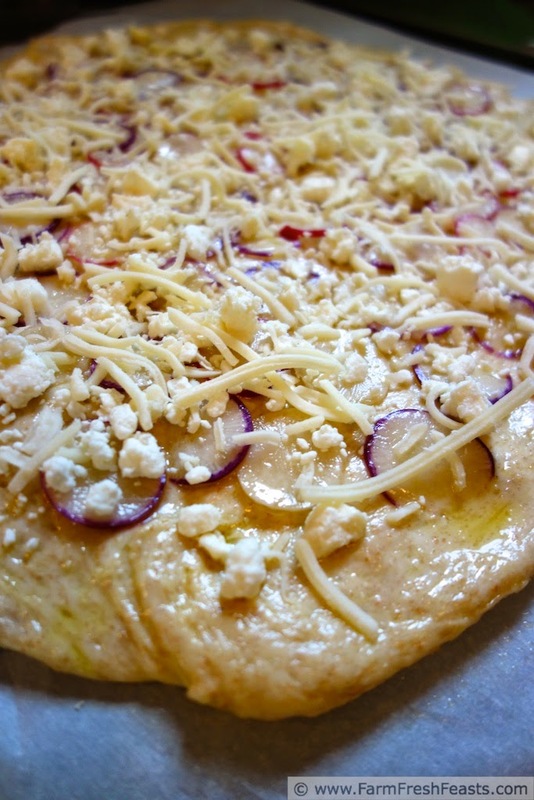 Thinly sliced radishes with feta, goat cheese, and shredded cheeses in a spring radish pizza. In the early weeks of Spring, while we're eating out of the tail end of the Strategic Winter Squash Reserve and scraping frost off the bags of vegetables in the freezer, I start to moon over the upcoming Community Supported Agriculture (CSA) season. I dream about trying old favorites, or new recipes with the vegetables I know I'll be getting, and ponder what might be new on the farm this year. One standby that will be in Spring farm share boxes is the radish. 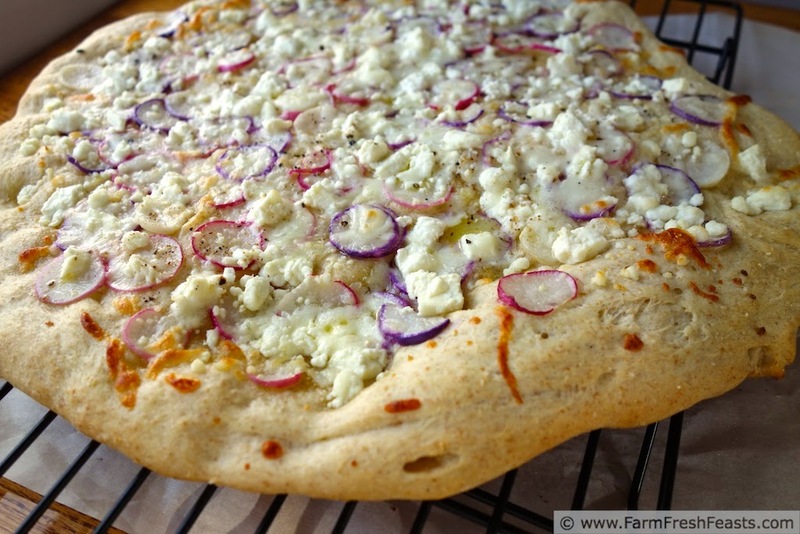 I knew I was going to put radishes on a pizza long before the CSA season began. Shoot, I throw so much other CSA produce on pizzas, such as kohlrabi greens, kale, broccoli rabe and sweet potatoes--see my Visual Pizza Recipe Index for ideas--why not radishes? Since I'm the primary radish fan in the house, and I don't want to overwhelm the neighbors with radish gifts, I wanted to try to entice my family in a new way. One way for me to keep things interesting is to change up the way I prepare a vegetable. If I'm used to roasting something, why not shred it, like this butternut squash-stuffed Chicken Saltimbocca? 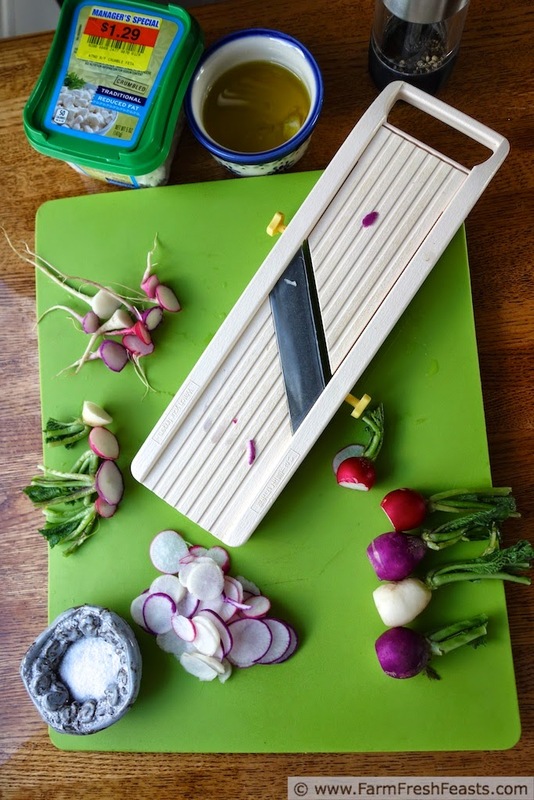 I've already enjoyed slicing radishes on sandwiches, and shredding them in sandwich spread--but when I sliced a mess of pretty Easter egg-colored radishes on my Benriner (link to Alanna's post that had me searching one out for my own) I needed share this, and share this in time for Easter. I knew that radishes with butter and salt make a lovely sandwich, and that's where I was going with this pizza. What I didn't expect was how delicate the pizza would look and taste. It's a very dainty pizza, feminine, if you will, just like Crystal the composting guinea pig's delicate, feminine ankles [you're welcome for my not posting a picture of a dainty pig ankle, but know that I really wanted to]. However it is robust enough for my son (who would happily live on meat forever) to eat all the leftovers. I think the combination of cheeses put it over the top for him--feta, goat, and shredded Italian blend? I'm in! For more recipes using radishes, please see my Radish Recipes Collection. It's part of the Visual Recipe Index by Ingredient, a resource for folks like me eating from the farm share, the farmer's market, the garden, the neighbor's garden, and great deals on ugly produce at the grocery store. Missing: goat cheese and shredded Italian blend cheese. Preheat the oven to 450 degrees Fahrenheit, and if you've got a pizza stone let it preheat as well. Here's an Amazon affiliate link to a stone similar to mine. On an oiled piece of parchment paper or a cookie sheet, stretch out dough into a pleasing shape. In a small bowl combine olive oil and smashed garlic until blended. Spread across prepared dough. Top with radishes, cheeses, and salt and pepper. Bake for 5-8 minutes, then slide the parchment out and bake directly on the pizza stone another 3-5 minutes until cheeses are browned. Slice (Amazon affiliate link to my beloved pizza slicer) and serve. Leftovers reheated well. Since Friday nights are Pizza Nights around here [even if I don't post a pizza recipe, know that we're eating pizza] and Friday Night Pizza Nights are worthy of Fiestas, I'm glad to share this Dainty Radish Pizza with Fiesta Friday. Another Friday we'll really get our Fiesta on with a Cheater Margarita Smoothie, but I need more taste testing . . . nah, the recipe is fine--I just want to do more taste testing! 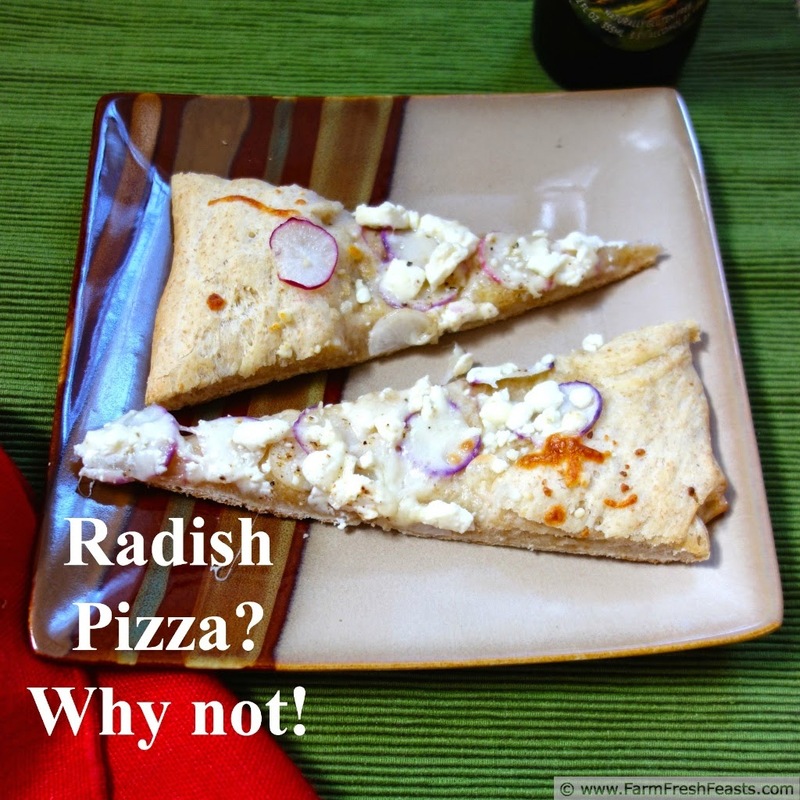 That is a great pizza idea, especially in the spring when we have so many wonderful radishes.. I must get me some of those purple ones. I have grown the red, the white and the pinwheel, but never seen the purple before. 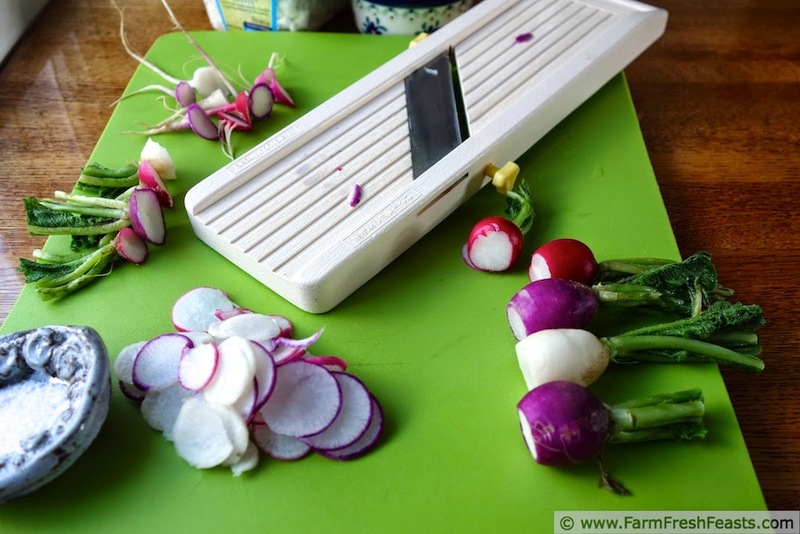 I've never heard of pinwheel radishes--I bet they look lovely sliced! Our second CSA in Virginia grew French Breakfast Radishes and I loved to dip those in salt and eat them. 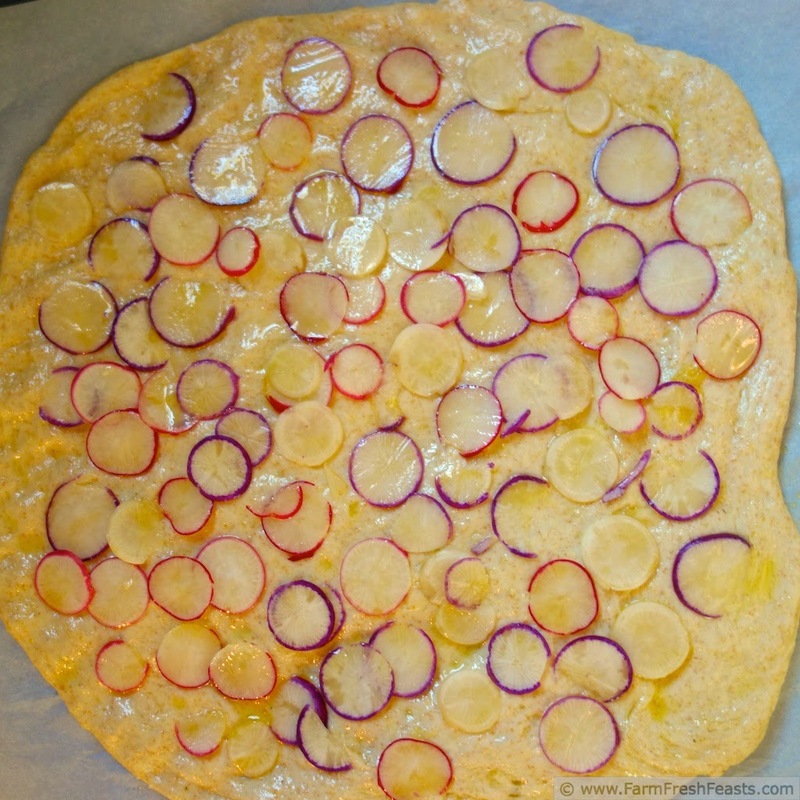 Radish pizza sounds really interesting and delicious! Thanks--I thought it may be weird, but I'm so pleased with how it turned out. And I'm inspired to build on this version this Spring--maybe some bacon? I'll add your site to my list! Great Idea. You are right, why not? I love how dainty it looks and I can imagine how delicate, yet zippy, it must taste. It did taste terrific--I know if my son cleans up all the leftovers it's an all-around winner. Thanks for stopping by! And I love your blog name--I started counting up all the legs in my kitchen! I'm envious of you and your radishes--but I know that soon I'll get some from our farmers, and coupled with the giant vat of Feta from my last Costco trip I'll be set. I have put radishes on a pizza before, but I included them with so much other stuff, you couldn't really tell. That is not the case with your dainty and feminine pizza. It is very pretty, and I would have liked to have seen Crystal's dainty ankle as well. 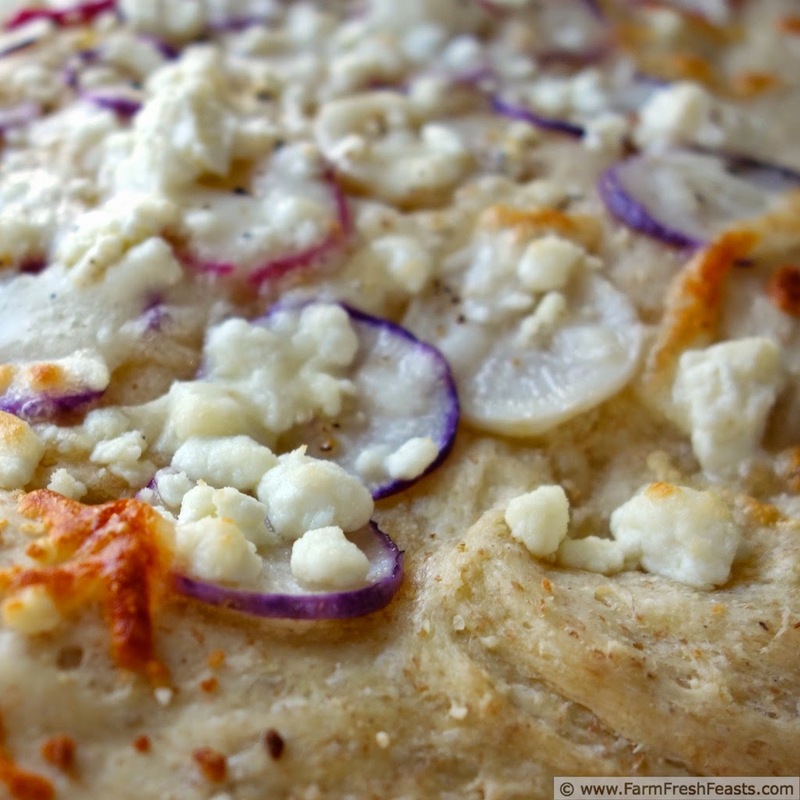 This pizza sounds wonderful, and I can't wait for the first rush of CSA radishes so I can make it. Although I've never gotten purple or white radishes before. No purple or white radishes?!! I'm going to have a talk with your farmers! I've had a variety of colors from the various farms we've joined--and liked them all, but thought the pretty colors looked especially pretty on this pizza. I'm sorry your experience with this pizza crust wasn't mine--I know how frustrating it can be when a recipe doesn't work out right. Back to your pizza crust--the problem is not using regular yeast since you let it go overnight. The beauty of the pizza crust yeast is that it has dough conditioners in it, allowing you to mix and go right into making pizza without letting the dough rest. You planned ahead and let your dough rest, so that's not it. Other things to think about--was your yeast fresh? Did you weigh or measure the flours? How hot was your water? When I have brick doughs, it's either because my yeast was old or I mis-measured either flour or water (our hot water heater is preset to be not too hot for kids so I don't think the hot water out of my tap could kill my yeast). This week I did plan ahead and made my dough, but next Friday I'll re-make Tender/Crunchy pizza crust with regular yeast and report back. Thank you--I appreciate your comment! Kirsten, thanks for the suggestions. The yeast was well within date, and I did the same thing I always do (with success) with water temperature (measured on my inside wrist), and flour (not weighed, but gently scooped and leveled). I shall try again, and since I think I've just rearranged my kitchen in a way that actually allows access to the scale, I'll try weighing the flours. It does sound yummy, and it didn't really taste bad...so I am motivated to get it to work.